Learning to lose weight through meditation doesn't have to be difficult. With this 30 minute guided meditation accompanied by an ambient soundtrack, creating a healthier mindset is as easy as pressing play. Throughout this audiobook, you will be guided from start to finish. We will begin with your current state of dissatisfaction with your current lifestyle and bring you to a relaxed state of calm awareness, where you will be able to push all of your unhealthy cravings into the distance and find peace within the positive affirmations for losing weight. 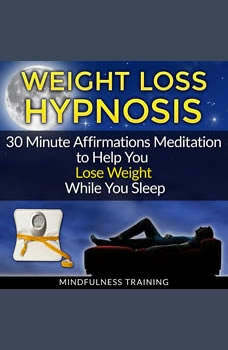 With this wonderful guided meditation, you can fall asleep to it every night and wake up in a positive healthy mindset each and every day, prepared to reach your weight loss goals. This meditation audiobook will help you: Remove cravings for unhealthy foods Increase your desire for exercise Improve your state of mind and healthy mindset Practice mindfulness Sleep better Change your life There's no need to stay in an unhealthy state of mind. Grab your copy and start beating the unhealthy cravings today!